Our recent Scholastic school book fair has ended successfully, and while I'm relieved that it is over, I really enjoyed learning about the book interests of the younger school kids in our area. The more popular titles at our fair included the Wimpy Kid series, the Tangled tie-in books, Barbie books, the Pinkalicious series, Toy Story 3 books, Lego Minifigure, Star Wars Clone War and Marvel comics titles. Some of the more popular picture book titles included Merry Christmas Splat, Llama Llama Misses Mama, Grumpy Cat, Snowmen All Year and Skippyjon Jones Lost In Space. In order to save Caveland, two caveboys, Ook and Gluk, living in 500,001 BC, must fight the evil chief Goppernopper and his descendants from the future. Using a time machine, Goppernopper and his descendants are stealing natural resources from the caveman days to supply their evil, greedy corporation in the year 2222. The Goppernoppers' enslave Ook and Gluk along with their friend Lily the dinosaur and drag them to the future. 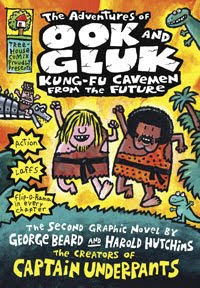 The caveboys manage to escape, remain in the future and take kung-fu lessons for seven years from the wise Master Wong. After intensive training in both fighting and philosophy, they embark on their "heros jerney" as grown men. At first glance, I can honestly say that I wasn't sure what to think of Ook and Gluk. Graphic novels really aren't my thing, and I'm not sure my oldest (a kindergartner) is ready for this story. The book looks and reads like something a 10-year-old boy would write, and thus it contains several intentionally misspelled words and uses words like suckas, barf, pee-brain, dumb head and diaper breath. So I sat quietly at the fair, watching and observing this one book, waiting for someone to comment. And, low and behold, one mom that I know and respect spoke up. She told me that while her oldest son, a sixth grader, loves to read, her second-grade son is just the opposite. Ook and Gluk happens to be one of her second-grader's favorite books. He thinks it is hilarious. She also said that while it might not be something she would pick out, she was glad to encourage any interest in reading, despite the misspellings and the cavemen-speak (cavemonics). 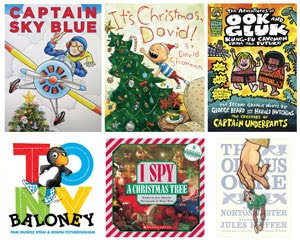 Find more book related fun at http://www.pilkey.com. • Contest ends on Monday, December 6th 2010 at 11:59 PM CST. What great books! I'd love to win this. I would love to win these for my kids- there is a wide variety and age range covered by the books. This selection of books are amazing. All my kids would love to read more than one of them, and that is a feat in itself. I can't believe the selection.It is perfect for the ages of my kids. This looks like a great collection to add to a home library! What a wonderful selection of books for the upcoming holidays! I love that these books are geared to all different age levels! We just went to the book fair at our school. This would be wonderful for my great niece & nephew. Great kids books! The daycare kids love the David books. I would love to win these for my classroom library. We love Scholasic books. I've already picked up a few for the kids' stockings this year. I'll admit that I am not excited about ALL the books in this pack, but I have an Anthony who we call "tony baloney" + he loves the I Spy books and I've been waiting to check out The Odious Ogre since I first heard about it. My son loves the Captain Underpants books, these shouls be awesome fr him to read. I'm not familiar with any of those titles! Our Scholastic book fair is in a few months, and it'll be my first as a mom. :) I'm looking forward to helping out with it! That is a great list of books. I love how the book you reviewed is written like it's from a child's perspective. My son loves Ook and Gluk! Great book selection! Several we'd enjoy and others we could gift to friends! I love having new books for my children. My middle child would prefer not to read but it is a rule that everyone reads for 30 minutes a day. I particularly want to read the David Christmas book. Thanks for the chance and the giveaway! My grandson loves the David books, they're his favorite. The one in this giveaway would be fun to read before Christmas! I wasn't too sure of the book at first either, but my son absolutely adores it, as well as all the Captain Underpants books we've read since discovering Pilkey's work. Thanks for the chance to enter! I subscribe to your RSS. Thanks! I'm an elementary school librarian and not a huge fan of graphic novels or "gross-out" lowest-common-denominator humor books, but I have to agree that they are popular and for a reluctant reader they might be a gateway to more reading and hopefully, better reading down the line. Books like Ook and Gluk are huge hits with my 3rd and 4th grade reluctant reader boy population. I would love to win some of these books for my preschool classroom. I would give the others to my godson. My son would enjoy reading these types of books. What fun, we (me and my grandkids) would especially love the I Spy book! I volunteered at our school's Scholastic Book Fair and the Diary of a Wimpy Kid books just flew off the shelves! I love the I spy books. Hmm... Ook and Gluk doesn't seem like my sort of book. I really dislike when there are misspelled words in books as well because it teaches kids the wrong way to spell it! I guess for an older kid that knows better, but my kids are all young so it would just teach them incorrect things. My little grandson loves the David books. WOW - we would LOVE to win this!! I have three kiddies who are avid readers and we are in need of some new books. I love Scholastic Books they are always the best quality and great stories! Taylee loves reading books that make her laugh. Captain Underpants is my hero! I love sharing reading to, and listening to my granddaughter read books to me. What an amazing giveaway! My daughter would LOVE to have these books! She is an avid reader and would be in heaven with these books. Thanks for the chance. Thanks for a great chance to win! This looks Great! I would give it to a friends son.